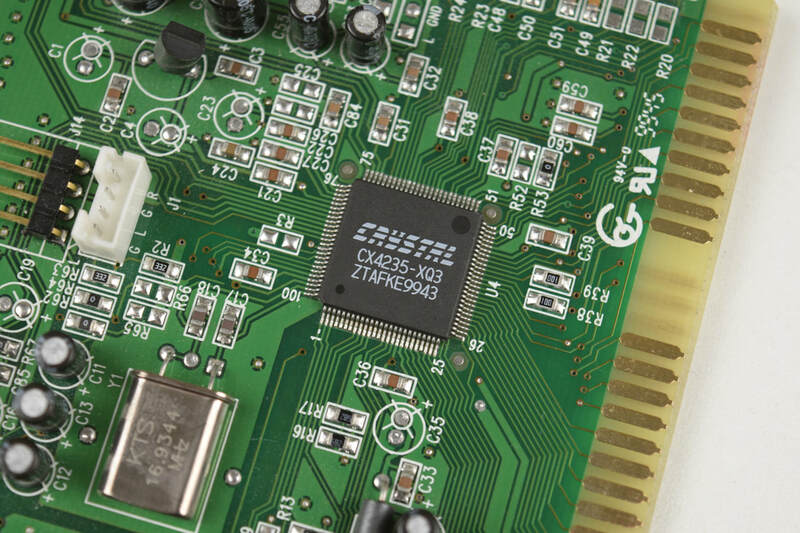 The Crystal CX4235 sound chip is compatible with Adlib, Sound Blaster, Sound Blaster Pro and Windows Sound System. It is a late era ISA Sound Card and uses PnP. This sound card is very compatible with the Sound Blaster standard, it worked with every game I tried and it has no issues with Stereo Sound Blaster Pro games. The FM implementation is not very good, some notes are off and there is some sort of distortion going on as well. The software is simple, but covers all the bases. You can manually assign resources by editing CWDMIX.INI and then initialising the card with CWDMIX.EXE /O. There is also a GUI Mixer utility, which will update AUTOEXEC.BAT. Setting for low noise with line-in and CD muted. Setting with line-in (for external sound device) and CD (from CD-ROM) functioning.